Kwinana’s 2nd Grade bowlers set up a crushing victory to claim the flag as 4th grade fought hard but were outlasted. 2nd Grade went in as favourites as they hosted fourth place Riverton-Rostrata. 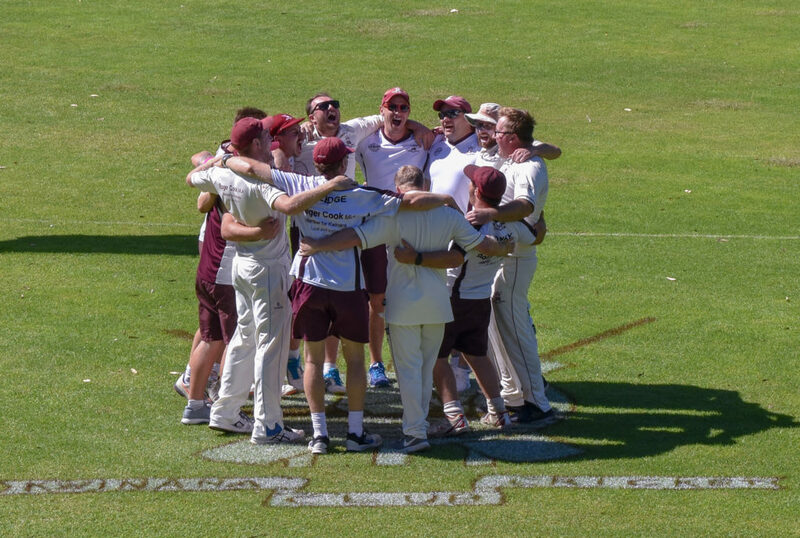 After losing the toss, Kwinana was asked to field and took full advantage. Andrew Gibbs (5-25) and Daniel Bell (3-5) had the ball on a string and used the bouncy home deck to reduce a hapless batting order to 7-18. The tail put up some resistance before Matthew Parnham took 2-1 to finish Riverton-Rostrata off for a total of 40. Kwinana was in the box seat but was rocked early at 4-12. Thomas Moore stepped up and put the pressure back on the bowlers with dashing stroke play. The bowlers wilted as Moore hit 56 taking Kwinana past the total. Bell came in late and rubbed salt into the wound making 42 as Riverton-Rostrata refused to give up. 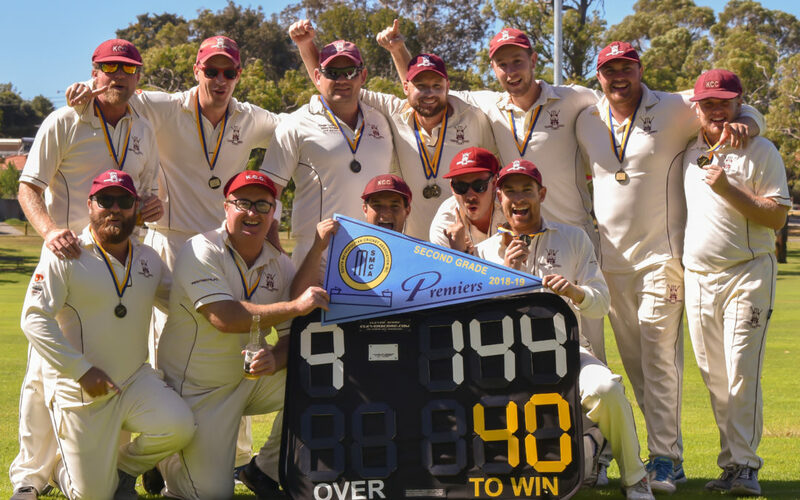 Kwinana finished the final all out for 144, recording a dominant victory and their first two-day flag since 2012-13. Kwinana sing the club song. Photos by Aaron Kirby. The final also saw a special moment for Brett and Bevan Kearney as they became the first father-son duo to win the 2nd Grade flag together. 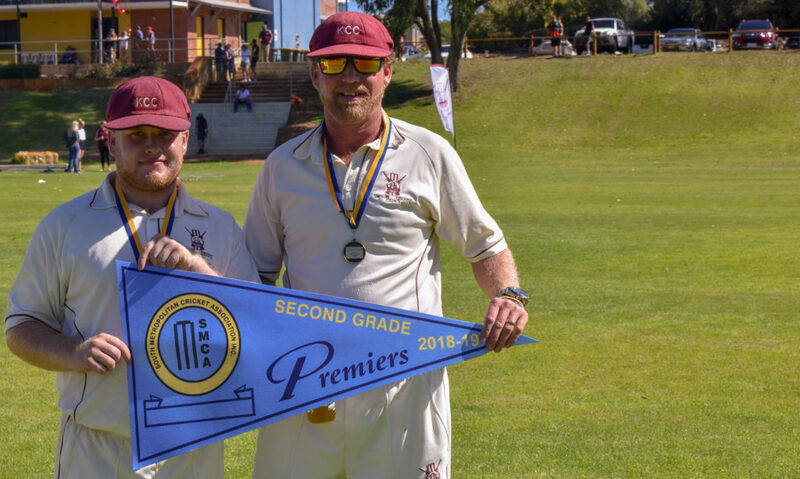 Bevan (Left) and Brett (Right) Kearney are the first father son duo to win a 2nd Grade flag. Andrew Gibbs was awarded the medal for man of the match. 4th Grade came into the final in great form having knocked off the minor premiers two games in a row. 4th grade bowled first and struggled early as Cockburn put on 109 for the first wicket. That first wicket gave Kwinana’s bowlers some fire as they took 4-31 to be back in the game. The fast bowlers toiled away, but fatigue took a toll as Cockburn past 200 before being bowled out for 212. Kwinana’s openers laid a solid platform of 34 before a collapse saw them in trouble at 4-58. Paul Silchinger batted superbly making 86 despite breaking his thumb in the field. Silchinger and Bart Pratt (36) put on 94 to get Kwinana ahead. Fatigue set in, in the latter overs as Pratt was run out and Silchinger fell not long after. Cockburn’s bowlers were too good for the tail as they were bowled out 33 runs short on 179.